There is ongoing debate about the safety of scuba diving for individuals with a history of epilepsy. An in-water seizure is highly likely to be fatal. 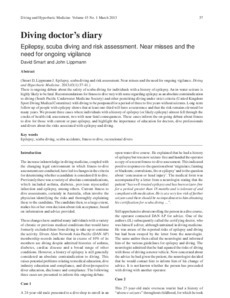 Recommendations for fitness to dive vary with some regarding epilepsy as an absolute contraindication to diving (South Pacific Underwater Medicine Society) and others permitting diving under strict criteria (United Kingdom Sport Diving Medical Committee) with diving to be postponed for a period of three to five years without seizures. Long-term follow up of people with epilepsy shows that at least one-third will have a recurrence and that the risk remains elevated for many years. We present three cases where individuals with a history of epilepsy (or likely epilepsy) almost fell through the cracks of health risk assessment, two with near-fatal consequences. These cases inform the on-going debate about fitness to dive for those with current or past epilepsy, and highlight the importance of education for doctors, dive professionals and divers about the risks associated with epilepsy and diving.